We’re looking for volunteers for the 2019 Golborne Road Festival! Kensington and Chelsea Council has announced a plan to build 600 new homes, including a minimum of 300 Council homes for rent. Two sites for possible building are located in Golborne Ward. The Council is now consulting on the proposals. Sing out in Golborne in 2019! Golborne now has its very own Farmers’ Market. It’s every Saturday from 9am to 2pm at the Spanish School on Portobello Road. It offers a fantastic selection of veg, fruit, meat, fish and baked goods. The 2018 Golborne Road Festival in July was graced by beautifully warm, sunny weather and the good folks of Golborne had a cracking time enjoying live music, food and plenty of fun for the children. Click through to view the photos. Golborne Life takes a look at one of the neighbourhood’s longest established restaurants, Palki. If you love Indian food that’s a cut above the usual fare, then this eatery at 44 Golborne Road will be right up your street. 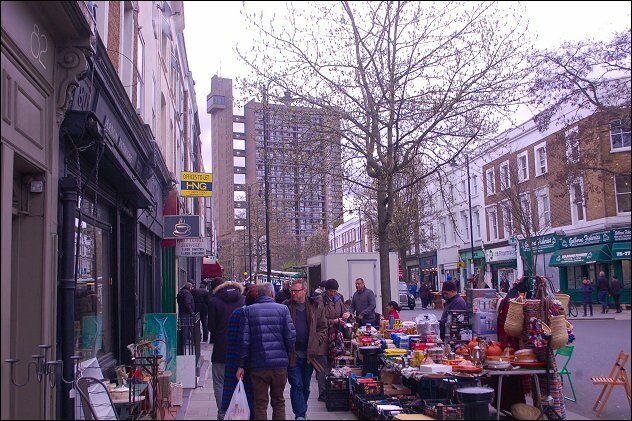 The RBK&C local studies librarian Dave Walker recently posted a fascinating two-part piece about Golborne Road shops on the Library Time Machine Blog. The first post looks at photos from 1969-70 and the second part publishes photos from 1997-98. There’s been a newsagent at 63 Golborne Road, on the corner of Wornington Road, for many years but it was in the summer of 2014 that current proprietor Samadali Muradi took over the business. Is there a ‘Science District’ in Golborne?